Bad habits. We all have them. Even if you're the most proficient, enthusiastic, outstanding writer in the world, you no doubt have quirks you'd like to overcome. No matter what your personal or professional writing challenges may be, once they have been identified, you can methodically work on overcoming them. Below are some commonly encountered bad writing habits and how you can work through them. You think of so many ways to describe something that you decide to use them all… and the result is a cluttered sentence. Adjectives and adverbs should add spice to any essay, column, blog post, novel, play or article; but they shouldn't overpower what you're trying to say. If the most memorable part of your writing is your flowery descriptions, perhaps it's time to pare back. Are all my adjectives and adverbs necessary? Could I say the same thing with fewer descriptors? Are adjectives and adverbs becoming the "main course" instead of "side dishes"? If the answer is "yes", it's time to slice and dice. Many people are perfectionists; they would rather write something great than something that's good (or mediocre). Unfortunately, such authors often procrastinate or cease writing out of the fear that they won't be excellent. If you're a perfectionist, it's time to get to the truth and face facts: Not everything you write is going to be outstanding, and you wouldn't want it to be! In fact, it would be rare if any writer - even the world's most wonderful authors - wrote perfect pieces the first time. The only way to get better is to take a stab at writing and make mistakes. 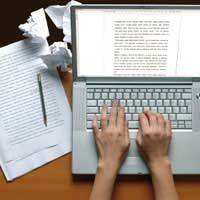 Do you have the bad habit of simply writing a piece and then sending it off to an editor or potential agent without even proofreading it? Then it's time to stop now! Everything you write that will be seen or enjoyed by another person should be proofread for consistency, grammatical accuracy and similar considerations. Though you may still miss some errors (you're only human, after all), you'll be less likely to showcase a faux pas to readers. "I'm not a professional writer, so why should I write every night?" While this statement is legitimate, no one expects recreational authors to sit down at their computers or notebooks each evening. However, it's still critical to write on a regular basis. Without a measure of consistency, your writing will lose focus and your voice will seem scattered. The only way to get better is to write… and that may mean you'll have to schedule a regular "date" with your keyboard. You cannot write in a vacuum… well, okay… you can. But if you never allow anyone to read your writings, you'll never have the opportunity to grow. Asking for (and accepting) critiques can be tough, that's true; yet if you never request objective, critical analyses of your writing, you'll remain stagnant. (FYI, the flip side of this coin is that if no one reads what you pen, you may never know how good you are, either!) So take a deep breath and ask for feedback.